Fried Okra is even easier without the breading, and tastes just as good. Easy to follow, step-by-step, photo illustrated instructions with printable recipe. Pan Fried Okra recipe with no breading. Super easy to make. We’re using okra fresh out of the garden for this recipe. And, we’re doing it a bit differently than what most folks would call fried okra, because we’re not using any breading to make it. This version is courtesy of a very dear and older friend that I have been known to spend hours talking on the phone with. Once we get started talking about cooking, we might both get carried away. In her younger years, Joyce grew up on a farm. She later had a restaurant of her own, and worked her last public work at an old country store. She’s always had a passion for cooking. Like me, getting in the kitchen for Joyce isn’t as easy as it use to be. We keep trying though. Smile. Joyce sent me a small bag of okra recently after she heard me say I hadn’t had the chance to get any thus far this year. I think her nephew has been keeping her in good supply, so she wanted to share the bounty. I was very thankful and grateful. Isn’t it great to have good friends? Joyce told me that she use to use a cornmeal breading on her fried okra, but in the last few years, she would just slice it and toss it in a pan with a bit of hot oil. So, I figured I’d give it a try myself. Probably like you, I’m more accustomed to having fried okra with a good coating of breading on it. We’ll just have to save that one for another time. I like it that way myself. Of course, this is much easier, and I like things that way too. Smile. I do think you’ll enjoy it if you decide to give it a try. And, if you’re worried about that stuff that turns some folks off of okra, you know, the “slimy” part, then have no fear, this turned out to hardly have any of that at all. I’ll explain later. Ready to give our Pan Fried Okra a try? Alright then, let’s head on out to the kitchen, and… Let’s Get Cooking. Pan Fried Okra, without breading: You’ll need these ingredients. 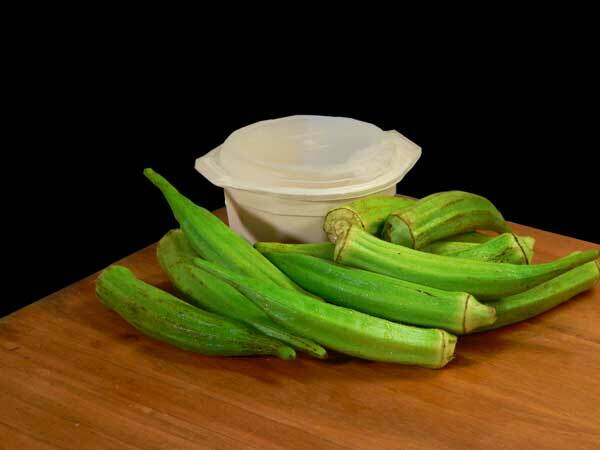 You can either wash the okra under some cold running water, or just take a damp paper towel and wipe each pod to remove any dirt. 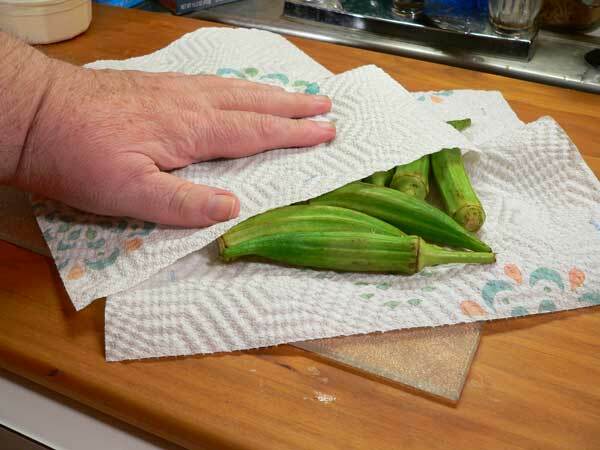 Place the washed okra between a couple of sheets of paper towel and pat it dry. Next, use a paring knife to cut off both ends. It’s a good habit to cut off the end that was attached to the plant by cutting just below the crown. If you were planning to cook the pod whole, cutting it at this point would help cut back on some of the “slimy” part by keeping the end closed. It’s not really going to make a difference with this recipe because we’re going to cut the okra pod into slices anyway. With both ends removed and discarded, slice the pods into slices about 1 inch long. The tip end would be soft enough to eat if you prefer to keep it on, but the end that was attached to the plant is too hard to be of any use. Place your skillet over Medium heat. Let the pan get hot, then add enough oil to coat the bottom of the pan. It doesn’t take much. Next, add in the bacon grease and let it melt. The oil needs to be good and hot before you add the okra. I didn’t have enough bacon grease on hand to cover the pan like I wanted, so I just used some regular cooking oil to cover the bottom of the pan, then added the Tablespoon of bacon grease to add some seasoning flavor to the okra. Once the oil is good and hot, add the okra to the skillet. You want to hear the okra sizzle when it hits the pan. 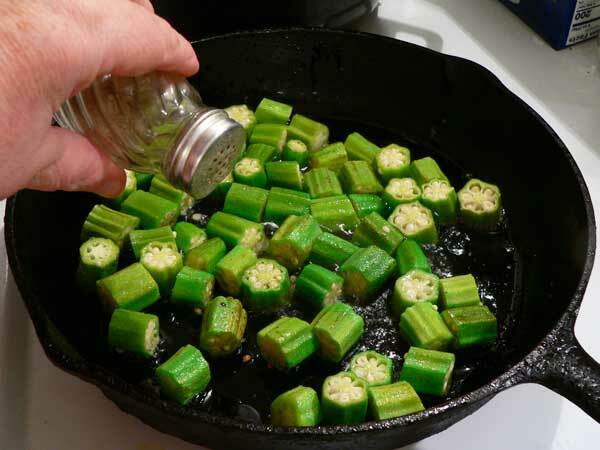 By having the oil hot enough to do this, you quickly seal the okra which keeps it from getting all slimy in the pan. You can thank me later. Smile. Once it’s started cooking a bit, season to taste with black pepper. Keep stirring the okra while it’s cooking. Continue to stir and flip the okra while it cooks. It will take about 8 to 10 minutes for the okra to fully cook. Let it cook until you start seeing some brown coloring on the sides and edges. Test a piece to see if it’s tender before removing from the pan. 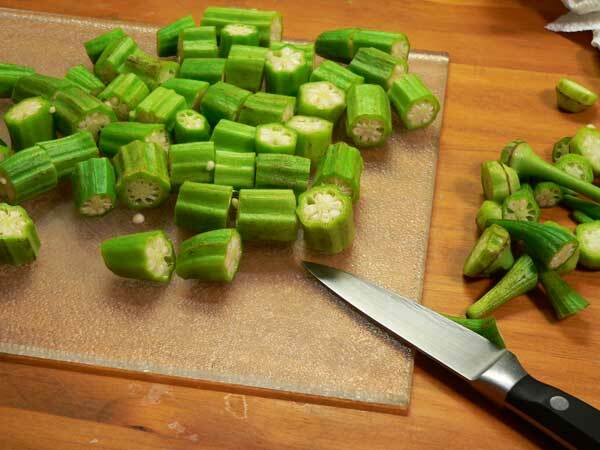 When the okra is done to your satisfaction, remove it from the pan and place it on a paper towel lined plate. Sprinkle lightly with salt to suit your taste. You’ll want to serve this warm. Some Hot Water Cornbread can turn this into a full meal. If you’re cooking several batches of okra, you can keep what you’ve cooked warm by placing it on a sheet pan and sliding it into an oven set at 200F degrees. 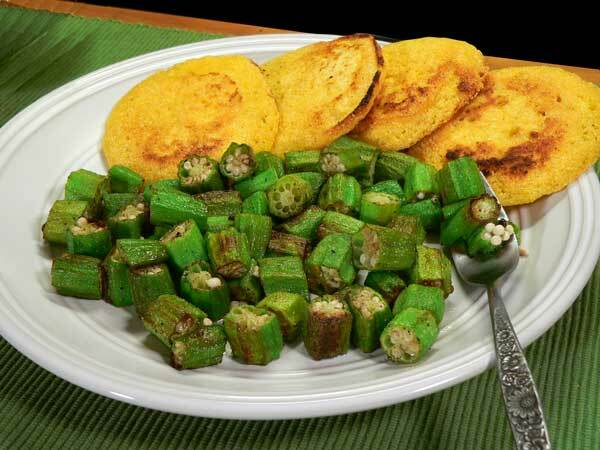 Pan Fried Okra without breading is an easy way to enjoy fresh okra. A little bacon grease added to your cooking oil will increase the flavor. 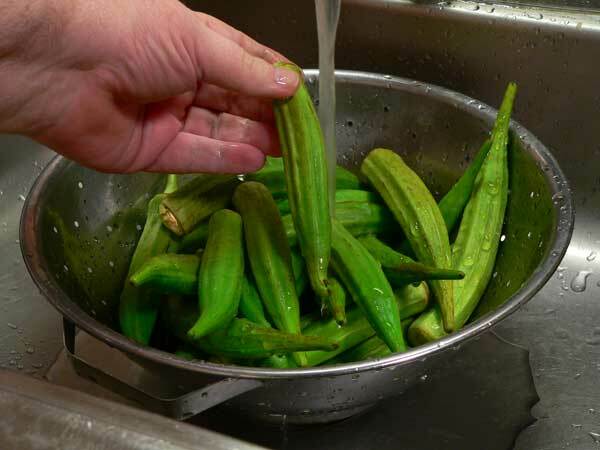 Rinse the okra pods gently under cold running water, or wipe each with a damp paper towel. 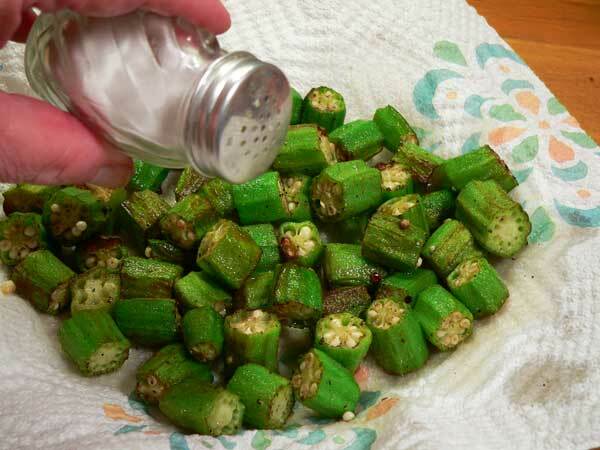 Remove both ends from the okra pods. Discard the ends. Slice each pod into pieces about 1 inch in length. 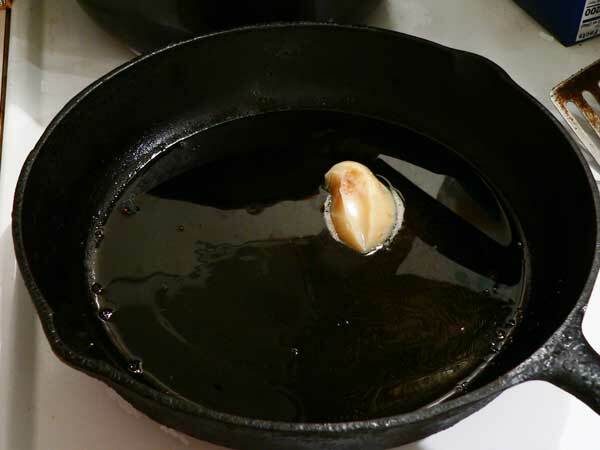 When the pan is hot, add enough oil to coat bottom of pan. Let the oil get hot, almost to the smoking point. 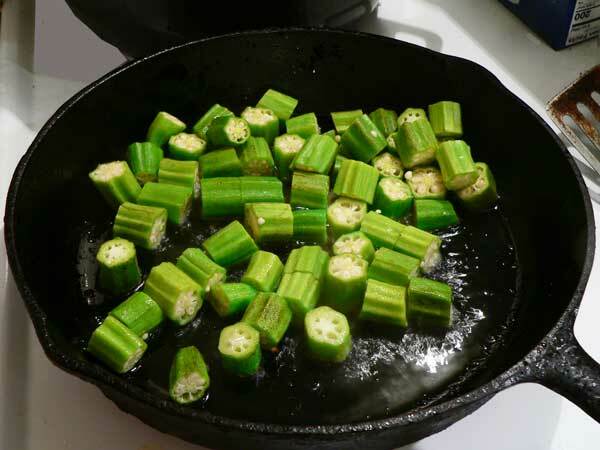 Turn the okra often as it cooks to let it brown slightly. 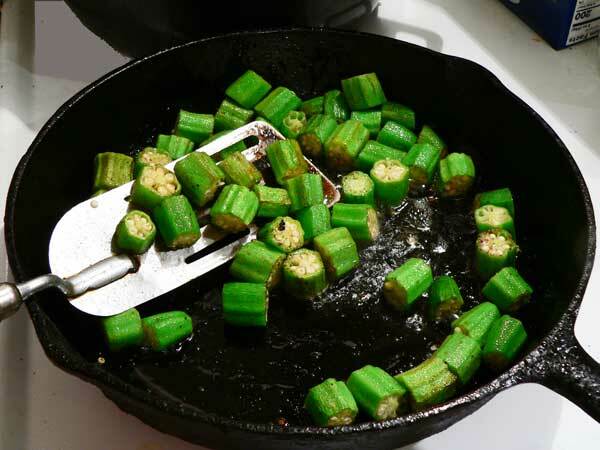 When okra is lightly browned, remove from pan, place on paper towel to drain. Add the salt to taste. If you’re cooking more than one batch, keep the cooked okra warm in a 200F degree oven while frying the second batch. Serve warm with some Hot Water Cornbread on the side. What’s your favorite way to enjoy fresh okra? Ever make it without any breading at all? I’d love to know how you like our recipe after you try it. Hard to come by okra up here in Fairbanks and when I do find it it never makes it to the pan. I eat it up raw, just like 26 years ago in the Piedmont. I love okra. When folks say they hate it I say more for me. We never ate okra, while growing up in Kentucky, I will pretty much try anything in the veggie family. I loved this, so will try to grow some next year! So easy and tasty! Love simple food! How do you make hot water cornbread? Never liked okra, but will give it a shot. My mother loved okra. Yes, this is the way we fry okra…without the breading. Sure makes a yummy lunch! Glad to hear you’re better than when the vertigo first started, but still would love to hear that you’re completely over it. Hope you get your pickles done. Hi Steve. I want to try this. Love okra and tomatoes…guess they could be added to this at the end? Have made your recipe for Salisbury Steak with onion gravy twice and my friends loved it as did I. Will say the 2nd time I added a tablespoon of A1 sauce and a tablespoon of prepared horseradish to the beef mixture with good results (added a little smokey tang) which I liked. Love your site and look forward to your post every Monday. wow, that sounds so easy! probably won’t miss the breading! i will need to try this! thank you for the BEST recipes! God bless you! Oh man, I haven’t had fried okra in years. The only kind we can get here in WA is the frozen kind and it doesn’t fry right. Maybe when we go home in the summer I can get some. Memories of mom cooking this is making my mouth water. Oh those memories…..got to love ’em. Be blessed. I ate lots of okra growing up in N C. because we had it in our garden. My Mama would slice and fry it. Also, she would leave it whole and put it on top of a big pot of butter beans or peas during the last few minutes of cooking. It was slimy that way but we all loved it. Never tried it without breading (cornmeal) going to try this though. I try to grow something different in my garden each year, last year tomatilos, but guess what this year was okra. I got a pretty fair amount so I’ll give this recipe a whirl. Will let you know. Thanks Steve, God Bless. Hi Steve, another great recipe, just like the squash and onions. 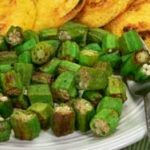 I now slice my okra lengthwise, just cut the top off and slice down the middle, dip in a little white cornmeal, not a thick batter just a light coating and fry, delicious. I do hope you get the chance to make some pickles for the NC State Fair. I love going to the fair to see all the canned goodies, it would not be fall in NC without visiting the fair. Hope you are feeling better each day. I’m going to the garden this afternoon and cut some okra. I’m willing to try anything one time. I want the hot corn bread recipe please. I was taught here on Hatteras Island to scald plain corn meal with a little flour to make corn bread dumplings. I am wondering if your corn bread is similar only you fry it! I Enjoy your website and you bring back many childhood eating memories. I will have to try cooking fried okra without cornmeal. I’ve never done this. 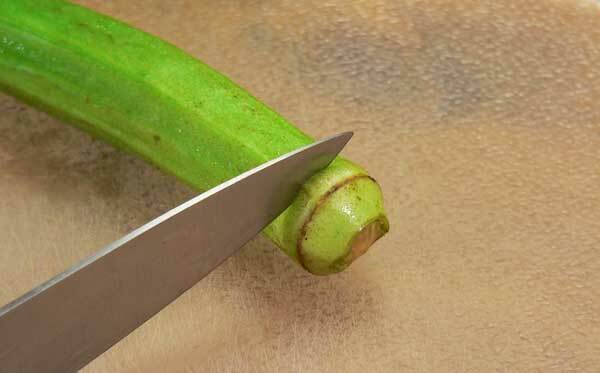 I slice the okra thinner than you do. My husband likes them crunchy. I’ll head to the curb market tomorrow to get some. Thanks! One more thing……. is hot water cornbread the same as hoe cakes? I mix cornmeal with salt and add warm water, and fry in oil until the edges are crispy. Is that what you do?